It has become clear that helping all students work and learn together productively in diverse groups and teams is important for a positive learning climate. From our discussions with students, positive learning and social experiences in groups, in and out of class, are critically important to the success and persistence of under-represented students in science and math. 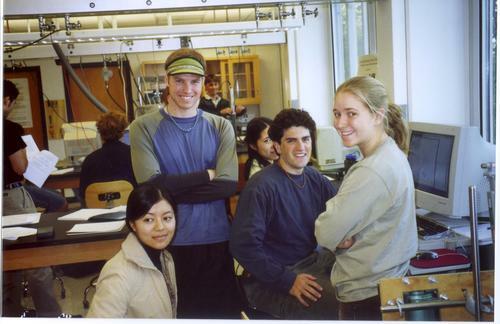 BIOL 232 Human Physiology: Teams of six students are assembled on the first day of classes. 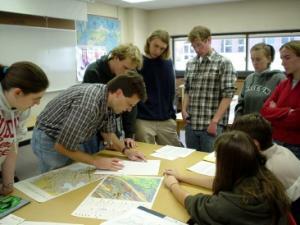 Throughout the term these teams work together during all classes and laboratories. Grading has individual as well as team-based components. Common activities include science cases and problems, medical cases, simple experiment design, and physiology tests that the students perform on their classmates. 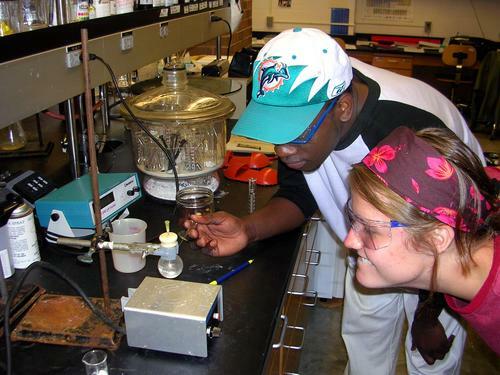 CHEM 230 Equilibrium and Analysis Lab: Students carry out all of their laboratory experiments in the Equilibrium and Analysis lab in groups of 3, with each student assigned a different role (Group Leader, Instrumentation Specialist, and Chemist). Students rotate through each role in a three-week cycle and then switch groups and rotate through again. The role-playing gives the students the opportunity to gain expertise in all aspects of the lab and to work in teams, similar to what they will experience in real-world scientific practice. PHYS 229/230 Analytical/Computational Mechanics has recently focused on understanding the course material by studying in detail the motion of a trebuchet (a medieval siege device) and the motion of the projectile it fires. During the course, students are assigned to small groups for three to four where they construct a small trebuchet and then model its motion using both analytical and computational techniques. The project culminates with a final paper and an evening of group presentations, with many of the students in dressed in appropriate costumes. PSYC 260 Policy & Health Projects: For this term-long Academic Civic Engagement (ACE) project, students in small groups critically examine the effects of public or private policies on health outcomes. Students go "into the field" to investigate an issue (e.g., heroin use prevention at Northfield High School or the dibetes management program at HealthFinders) by conducting interviews and reading relevant policy manuals. They then propose policy changes supported by theory and research that could have beneficial health effects on the target population and summarize their findings in quasi-professional consulting reports. At the end of the term, groups present their findings to the class and community members at a poster session.